Mister Money is what it’s all about – money and tons of it! Real Time Gaming has created a slot machine which has the theme of what we all thirst for – the luxury life of a millionaire. Mister Money uses all the items that one could imagine to own as a rich person; the sports car, the private jet, the Rolex and of course the beautiful women. This slot machine has 5 reels and 20 playable lines. It also has a free game feature and a double payout for spin wins that involve the wild. 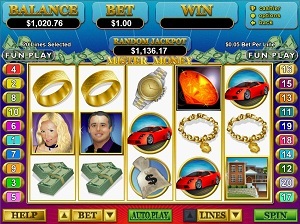 Mister Money is the dream that might come true if you get lucky enough to hit jackpot. The Mister Money slot machine from Real Time Gaming makes no effort in avoiding what it’s all about – Money! The background of the game window has the same colour as the American dollar notes. The symbols on the reels are very sharp, shiny and colourful. In this slot machine you will see a lot of gold, diamonds and other shiny items that enhance the luxurious feel. The main game has no music but if you hit certain symbol combinations a cool jazzy musical tune will start playing during the coin count. There are no card deck symbols in this slot machine which is a nice change. All symbols are fortune related. You will see lower paying symbols such as bundle of cash, watches, necklaces and rings. The wild symbol is a huge white diamond and it will substitute for all others including the scatter. The wild will also double your spin wins when substituting for a winning combination. The scatter is a red diamond and if you hit three or more you will trigger the bonus feature. The bonus feature is a free game feature which is triggered by you hitting three or more scatters on the reels. Once you have done this, you will pick a money bag from a game window of 15 money bags to choose from. The selected money bag will reveal if you have won free games or a multiplier. All free game wins are doubled during the bonus feature. Mister Money has 5 reels and 20 lines to bet on. You can easily configure your betting preference if you click on the Line button in the lower part of the game window. The minimum bet per line is $0.01 and the maximum is $5. Mister Money also has an auto play function which is very easy to use. « More slotmachines guides Article last updated: Thursday, July 19, 2012.